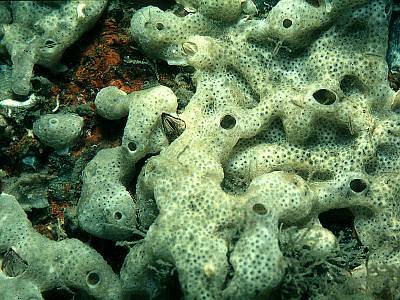 Description: This ascidian forms extensive loosely attached sheets over other sessile animals, such as bryozoans and sponges. The sheets are wrinkled, with regularly scattered small inhalant pores and irregular larger exhalant openings, usually on raised parts of the colony. The usual colour is a dirty off-white or beige. Colonies may become free hanging, growing out from their support on overhanging surfaces. 3mm thick x 150mm across. 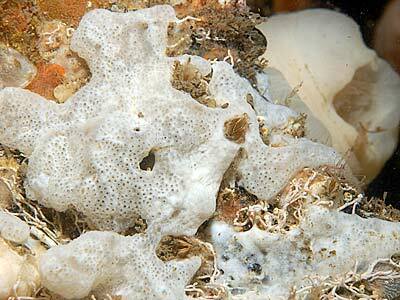 Habitat: A common ascidian on the lower shore and in shallow water. Similar Species: Could easily be confused with Didemnum maculosum or Lissoclinum perforatum. Trididemnum delesseriae forms smaller colonies on sublittoral algae. Structure of zooids with 3 rows of stigmata (other didemnids have 4 rows). Picton, B.E. & Morrow, C.C. (2016). Trididemnum cereum (Giard, 1872). [In] Encyclopedia of Marine Life of Britain and Ireland.